This designer told me "YES"...wait, but...this other designer told me "NO"... oh, I don't know. Well folks I think it's time to figure this out together! To this very day when I visit my grandparents house I am confronted with a wall full of eye looking back at me, one pair of those eyes is my graduation photo...high school graduation.... I really need to get my grandparents a more recent photo of myself. I digress. When I decided to tackle the age old question of doing a family photo wall, my gut reaction to the question was much the same as yours would be "Yes...but no." To start, I believe a home is the place you enjoy with the loved ones in your life that you call family; whether that means four-legged fur babies, another human or two, your parents, roommates, best friends, and even memories of places you have traveled. Because this is a place where you enjoy with loved ones, why not show them off? I am 100% on board with family photo walls in a home, as long as they are properly designed and in the right area of the home. 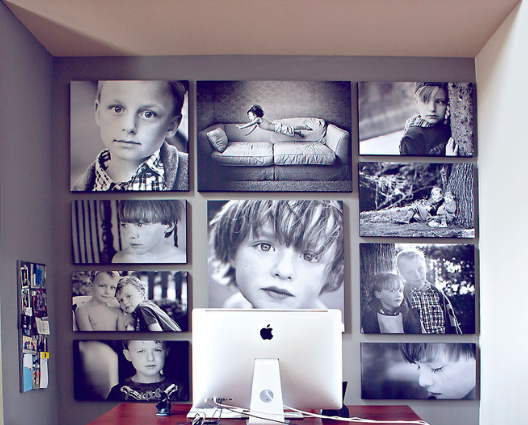 Here are some examples of different successful family photo gallery walls. With the structured look you can have all the same size and style frame, or frames that are the varying sizes that flow nicely. The most important thing with the structured look is the gallery wall is uniform, often fitting inside an imaginary rectangular area. This is my personal favorite look. Because a photo gallery wall can easily become chaotic, having all of the same frame in an area tends to calm down the chaos. 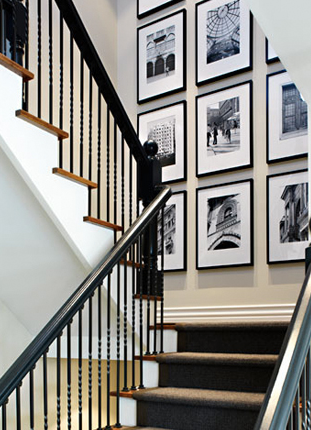 A gallery wall isn't limited to just framed portraits of people. Sometimes I like to mix in some objects that mean something to the family, pieces of art, sculptural items, end a monogrammed letter here or there. For those eclectic galleries, I love a tight clustered look on a small wall! This has been a huge craze for the past 10-years and is the easiest way to jump the shark way to quick. Generally, I say to keep the number of family photos on a canvas limited when using them in a gallery style. Additionally, the placement of these canvases are super important, These are also the style family photos I see in the most awkward spots. In my opinion, a huge naked photo of your baby should not go in the dining room... Now, I do like the photo on canvas look, but as stated above, use them sparingly. A good rule of thumb is in a group that creates a more structured look, or even just a single canvas not in a group. "Less is more." A truer statement has never been uttered for those of us who stress out with that cluttered look. If you are like that, try to simplify the idea of a family photo wall and just do a simple pair of pictures on your wall. This shows you still love your friends and family without junking it all up. Paintings of a client's animals adds a classic take on the "family photo"
When I have a client who strongly feels like they want a gallery wall, I always suggest we do something simple on a supporting wall in the house because most of the time gallery walls are just that, a supporting feature in the home, not that main act. However, every now and then, I get a client who is willing to commit to making the gallery wall THE SHOW STOPPER. If this is you, be sure you commit, because if you don't, it'll be a huge miss. This look is so fun those walls you want to add a little dimension to. When creating the layered look on a shelf, be sure you use all different size frames while maintaining the visual balance of the negative space from the wall behind. You can do an entire wall to make a statement or a simple single shelf in a smaller area. A fun designer tip is to sprinkle in some sculptural pieces to add in a little fun!